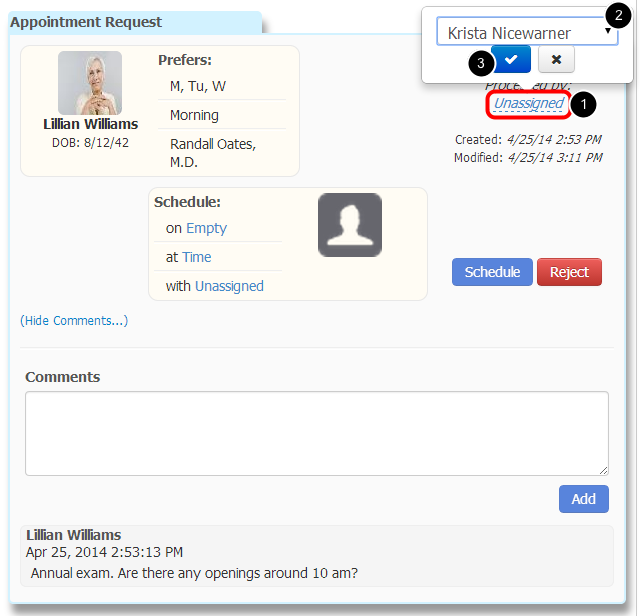 Q: How do I respond to an appointment request? Click to select Appointments from the My Health column on the left. 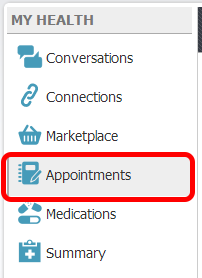 On this page, you will see a tab for each facility for which you have permission to manage appointment requests, as well as a tab to manage your individual appointment requests. 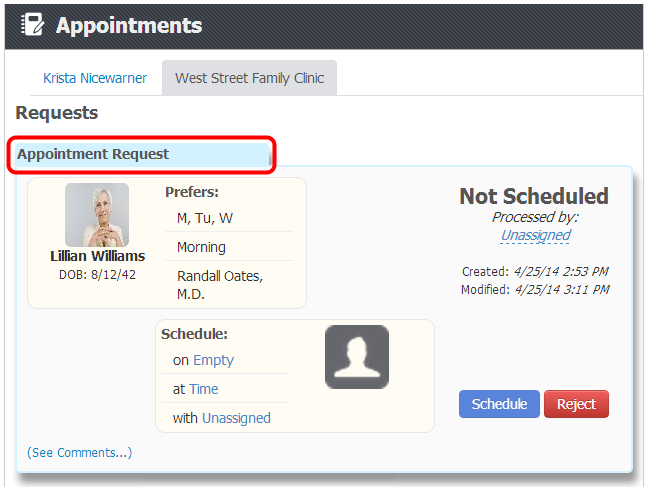 Click on each tab to view the list of appointments related to that particular tab. *Note: You will only see your name if you have permissions to make your own personal appointment requests. 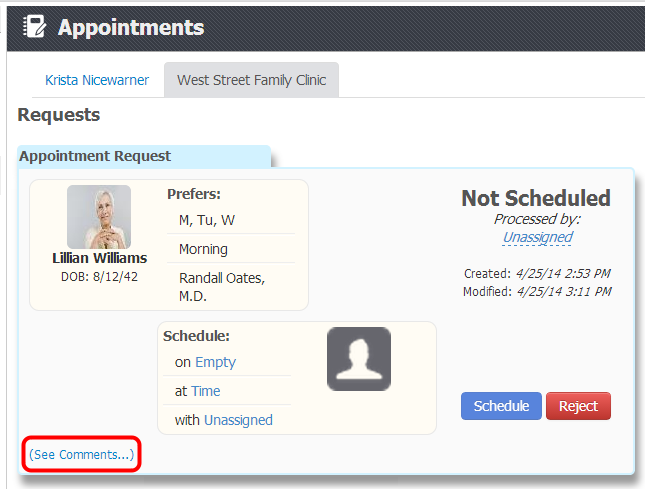 After clicking on the desired tab, a list of appointment requests will be displayed. Appointment requests colored in blue have not been processed by the clinic staff. 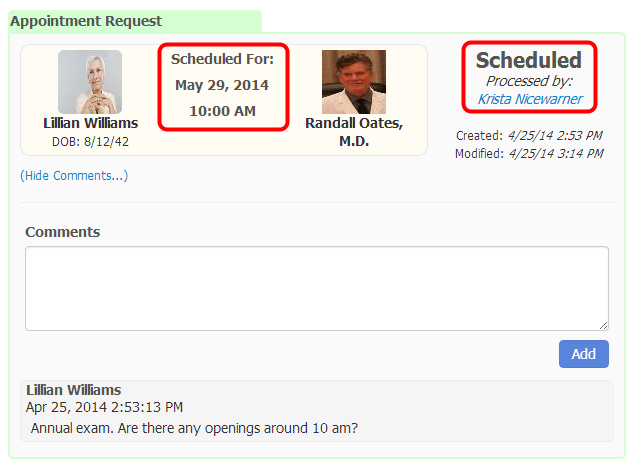 Appointment requests colored in green have been processed by the clinic staff. 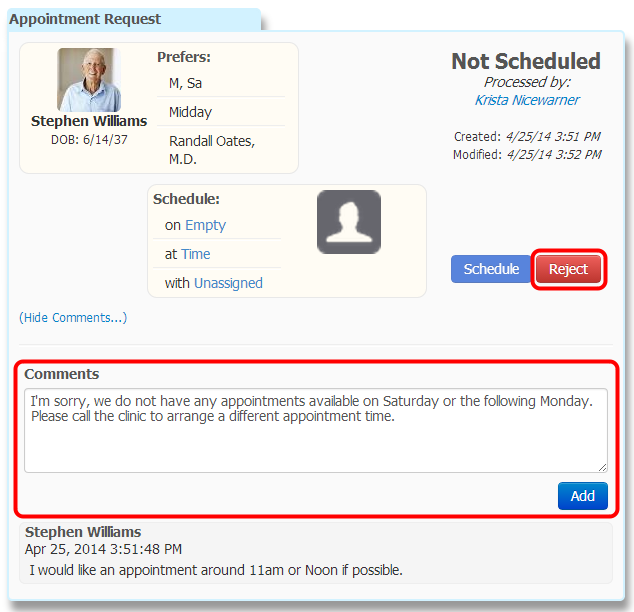 To view comments that are attached to the appointment request, click on (See Comments...). All comments will be displayed in the comments area in chronological order. 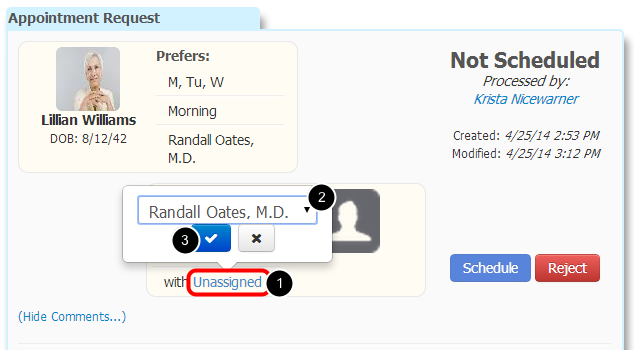 Initially all requests will be marked as unassigned until a provider is selected. Choose a provider from the drop down menu. Click the Blue Checkmark to save. Using the calendar, select the appropriate date. Click the Blue Checkmark button to save the appointment date. Select the appropriate time (times are displayed in military time). 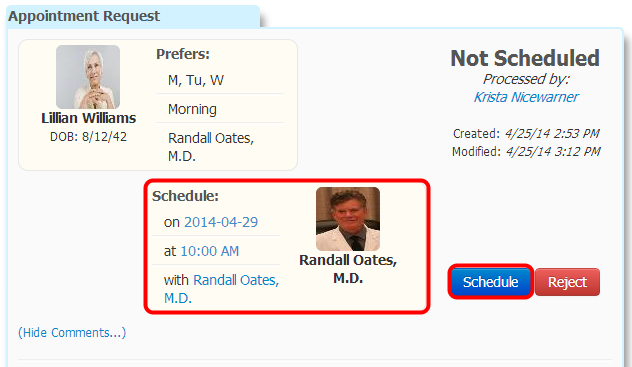 Click the Blue Checkmark button to save the appointment times. Using the drop-down menu, select the appropriate clinician. 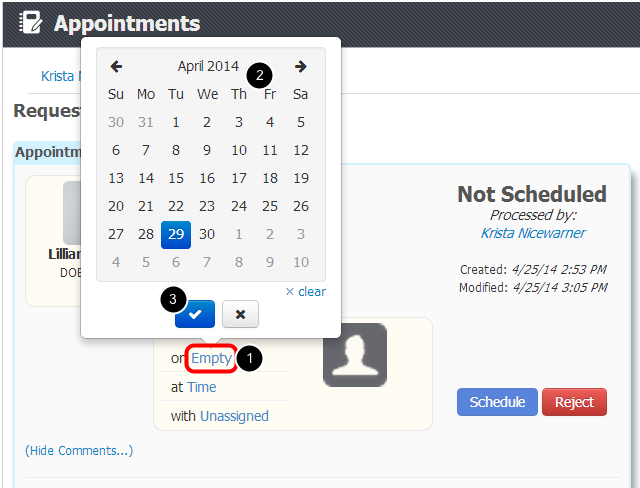 The appointment details will be displayed within the Schedule section. 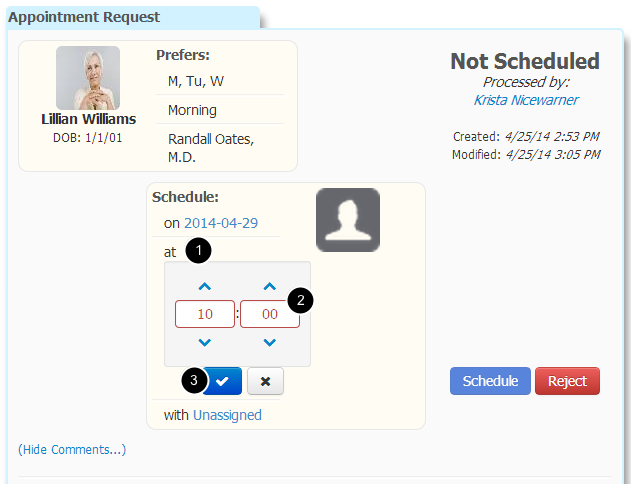 Click the Schedule button to notify the patient of their scheduled appointment using myHEALTHware. The appointment request has now been scheduled. To reject an appointment request, click the Reject button. 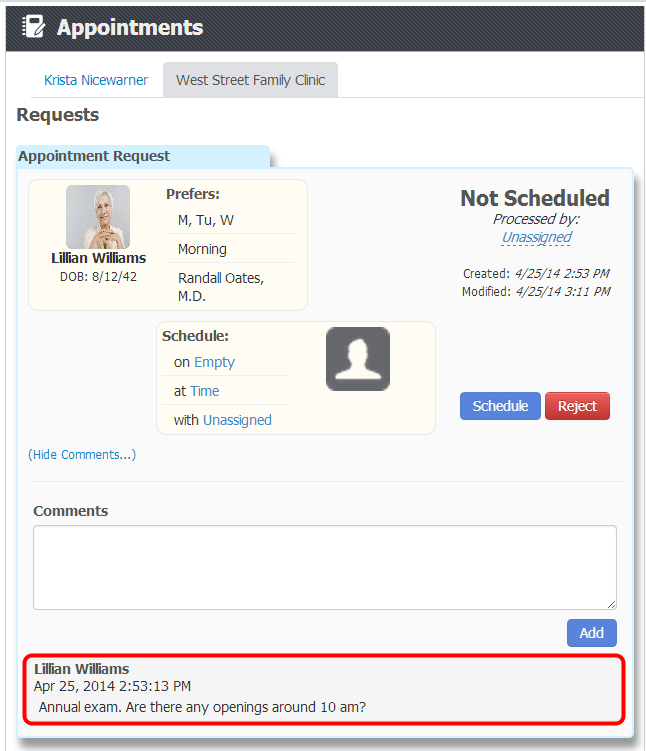 You can add comments to the appointment request, prior to rejecting the request, to instruct your patient on the process they should take. To add comments, simply click on (See Comments...), then enter your text into the Comments section and click the Add button.